Prepare your Shields of +451 Fire Resistance! Ah, madness marches inexorably onward. I feel I should be wearing some sort of amusing hat for this. I'm calling it. People will vote for valve because of steam sales and not because of DOTA 2 which was the only game they released in 2013. I tried to play it safe and voted for the most productive game company of last year. So no Valve for me. And voted. Fingers crossed that one of Nintendo, Game Freak, Mojang or Telltale games are the winning horse. Dude. Bro. Dude. Dudebro. Man. Dude man bro. Bro dude man. Man. Bro. Dude. Man bro man. Dude man bro man man dude. 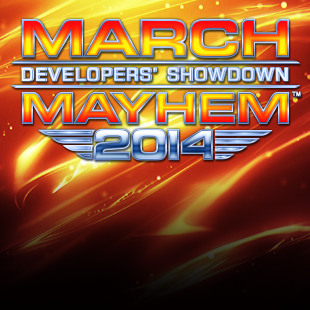 Anyways, YAY MARCH MAYHEM. Time to start tailoring this avatar. That made some of my decisions weird. I thought Bioshock was just ok, but I didn't play anything by Valve this year (not a MOBA fan). If I was picking favorites, I'd definitely take Bioware over Naughty Dog, but I have no interest in the Star Wars MMO, so now I'm picking Naughty Dog? Haven't played Last of Us, but it looks ok.
Luckily, Paradox has put out a lot of good new games and excellent DLC for CK2, so I have them winning. Oh dear Christ, not this again. Yes, they will. As they may. This is a popularity contest. There are no rules. You may vote for any reason. You may vote for a company because they made your GOTY 2013. You may vote for a company because of their charity work. You may vote on a company based on which protagonist had the best hat. You may vote based on how many Vs are in the company's title. Please don't talk about how "unfair" it is that people aren't voting based on how you arbitrarily decided people should vote. It's a popularity contest. It's about which companies you like, not what they've done. Don't make me drag out the Minecraft Fury-n-Tears-O-Meter. Again. So basically out of most of this competition Valve is going to win by a massive landslide yet again?, wake up up when something different happens like maybe if Gamefreak or nintendo actually win at something. ...Don't make me drag out the Minecraft Fury-n-Tears-O-Meter. Again. No Rockstar? Huh, that's surprising. Oh well. It always pisses me off when people create their own rules for voting and try to force them on others. Just like lacktheknack says, you can choose any criteria you want when you vote, but stop bitching just because people don't use your criteria. Dammit! This is already too close to call!! So, I still have no idea what March Madness is. After I make this post, I am going to go choose a bracket, whatever that means. Edit: I voted. I mostly ignored the companies I didn't recognize and voted for the one's whose games I spent the most time on. Did I do it right? as always, i voted for companies i personally liked rather than those that i think will win, and as such i have no chance of being correct. Ha, I remember that :D please do! I've selected the cliff and am building the scaffolding. My predictions are always horribly wrong. Maybe it's cuz I keep voting for Bioware at every opportunity. To make things worse, I voted for Volition over Blizzard. There should at least be a rule that companies which have already won a bracket are excluded from future contests. At least for a couple years, anyway. For the sake of balance. If you're going to have the same couple fandoms swamping the polls year after year, there's no reason to have a contest at all. That's not what's happened, though. First year: Turbine won because they alerted the troops, beating out Harmonix. Much rage was had. Second year: Turbine won again, as above, beating out Bioware. Much rage was had. Bioware would continue to be the runner-up every time afterwards. Third year: There was a terrifying 4Chan infused slap fight to take down Zynga. We did so (with much blood), and Valve won the final less-consequential round. Fourth year: Mojang dark-horsed everyone. Much WAT was had. Fifth year: The only really boring one, where Valve harmlessly won. Notice how none of the years minus the first two played out even remotely similarly. Strange to see only 16 devs in the tournament this year. I thought the whole point was that this was mirroring March Madness with 64 teams in it? I preferred the 64, those first two rounds were fun when picking out potential dark horses or seeing the big names get a run for their money from the tiny devs. With only 16 though, there isn't as much variety; all the AAA devs are big names and all the indie devs have a devoted fanbase. You could argue that they've just gotten rid of the first two 'useless rounds' and we're only left with the potential winners, but it was fun seeing all the names who had at least a shot at winning, even if they never would realistically. Gamefreak beats Irrational on my bracket. It's the first time I had to eliminate Valve on round 1. I feel dirty. I had to vote for Irrational Games. I keep replaying Bioshock 1 and Infinite like they're the only two games in existence. Well, I'm voting based on who put out the better actual content in the last 12 months. But since this is the Escapist, I assume Valve will win.